that 30.5 kJ/ mol is conferred by ATP molecules physically bumping around the reactants X and Y, the kinetic energy of the above reaction being what does it? I mean, is the energy coin of ATP conferred to reactions by molecular collisions, or is it an electric field effect in the spatial geometry the way the ATP molecule tends to break apart? Usually in biology (and being ATP, it most probably is biology), it's one of two things. The gamma-phosphate (the third one, the one farthest from the adenosine) is very unstable, meaning the phosphoanhydride bond is easy to break. The cell "allows" it to break, but only at the cost of moving the phosphate to some other molecule, such as a serine or glycerol or fructose or whatever. This phosphorylation creates a bond with lower energy than the phosphoanhydride, and so is overall favored. Imagine the personification: the gamma phosphate hates being attached to anything, but hates being attached to an ADP the most. Alternatively, if ATP hydrolysis is coupled via an enzyme, it is usually done through transient storage of the energy is protein conformation. An enzyme binds ATP, which makes the protein structure "bend" or conform around the ATP. This puts loads of strain (energy = A) on the protein which is offset by the stabilization of binding the ATP (energy = B). This strain can make an enzymatic surface open up on the protein which itself takes a lot of energy to make (energy = C). The surface can catalyze some reaction (X+Y->Z in your example) that costs some energy (energy = D). The completion of that reaction alters the enzyme's catalytic site to something new and higher energy (energy = E), which can be alleviated by cleavage of the ATP (-7.3 kcal/mol). 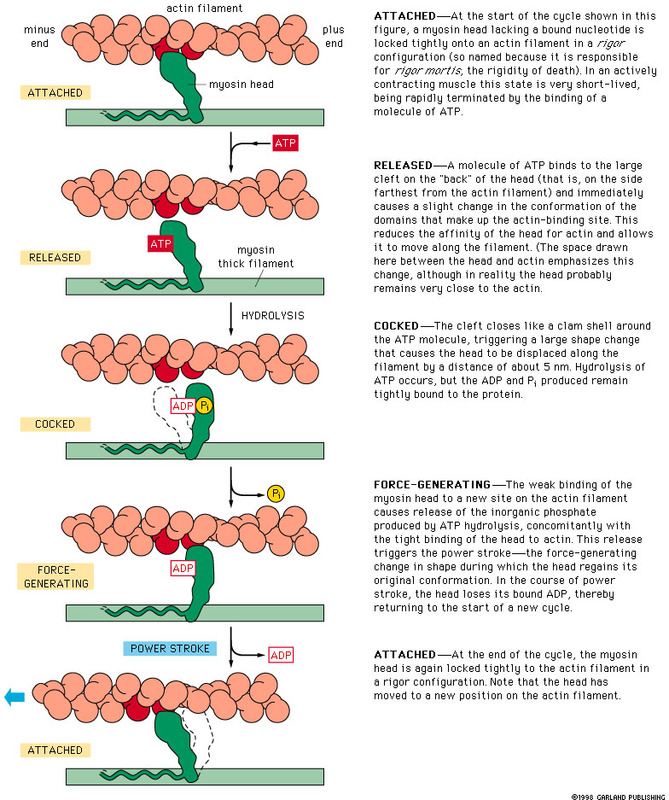 Alas, ADP and P do not fit well into that site of the enzyme, so they float out, restoring that original ATP-binding surface to it's original state. Provided A>B>C>D>E>-7.3, the cycle will continue until the ATP is exhausted or you have no more Z to make. Chemical reactions are based on collisions, but only those with the right amount of energy and the proper orientation give rise to them. If just one of these parameters deviates enough, the reactants will just bounce off. Within a cell, collisions between reactants are likely to happen, as one molecule is likely to collide with its enzyme within a second,[1, p. 6] but not in the right orientations. Enzymes through a moderate affinity to the reactants, place them in the right orientations. Now, where does the energy come from? The molecular "storm" of water molecules around does have quite a bit of kinetic energy, but as collisions with them come from all directions, they usually cancel each other. When ATP hydrolyzes, about 0.36 eV of energy are released (5.8·10^-20 J), and the molecules around it vibrate. I suppose that this is because once the chemical bond is broken, the repulsive force between ADP and phosphate is very strong at such a close distance, violently pushing whatever molecule they find on their way. The amount of energy released has 14 times the average kinetic energy of the molecules around it, so it is the equivalent of locally heating a molecule to 3,900 ºC. Naturally, if the hydrolysis happens within an enzyme, it vibrates like crazy and induces a conformational change. If the enzyme has reactants bound to it, they are likely to collide with the right amount of energy. Interestingly, the molecular storm is powerful enough at 150 ºC to break down ATP. This is why scientists do not expect to find any hyperthermophile living at such warm temperatures. Currently, the archeon Pyrolobus fumarii holds the record, being able to survive up to 122 ºC, but its optimal temperature is 113 ºC and "freezes to death" at temperatures lower than 90 ºC [Wikipedia]. Goodsell, D. "The Machinery of Life". 2nd edition. Springer. 2009. Hoffmann, P. "Life's Ratchet: How molecular machines extract order from chaos" Basic Books. 2012. Two parallel F-actin strands must rotate 166 degrees join correctly together. This creates the double helix structure of the microfilaments found in the cytoskeleton. ATP is well described on wiki in at that level. It seems to imply that there is a "static/magnetic" electrical charge differential surrounding the actin molecules and transferred in the minuscule H2O medium which attracts rotates and bonds them. I'll try to synthesise some quantim articles of that kind for a coherant sequence of events, ill have to pause because im writing on a phone. Not the answer you're looking for? Browse other questions tagged biochemistry molecular-biology biophysics or ask your own question. What is the use of futile reaction cycling such as Fruc-P to Fruc-BP? Is there a difference in the energy produced from the hydrolysis of GTP and ATP?